Created by artist Ray “Bubba” Sorensen, The Freedom Rock® Tour was designed to honor veterans and provide a unique piece of art to each of Iowa’s 99 counties. So far 20 counties are included on the tour. The original Freedom Rock® in Adair County is repainted each May in time for Memorial Day. The other Freedom Rocks will not change. Shelby County' s Freedom Rock is located at 257 Railway Street, Earling, IA in what now is referred to as Veteran's Park. Visit Travel Iowa for a current list of cities in Iowa. Danish Windmill - Elk Horn's Danish windmill was built in 1848 in Norre Snede, Denmark. 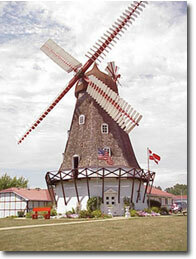 Elk Horn is host to the only authentic, working, Danish windmill in America. In the 30 years that Elk Horn has enjoyed this mill, it has become one of the most popular and successful tourist attractions in Iowa. Established in 1983, The Museum of Danish America is located in the heart of the largest rural settlement of Danes in the U.S. Our mission is to celebrate Danish roots and American dreams, and we are the only national museum dedicated to the Danish-American experience. Many of Shelby County cities were settled by German Catholic families. This strong heritage left a lasting mark, which is evident throughout the communities and best seen in their historic churches. Five of these communities, Defiance, Earling, Panama, Portsmouth, and Westphalia, make up the German Villages Tour. The outer beauty and the craftsmanship of the interiors will absolutely stun you. A day touring these magnificent structures is a day well spent. Travel back in time to an 80-acre working farm exhibit, featuring the machinery, tools and primitives of an authentic late 1880s farmstead. The farmstead grounds include the original Carstens family home complete with all the furnishings. Come see steam engine threshing, antique machinery, parades, crafts, food and entertainment during Carstens Farm Days, our annual farm show. The two-day event is held annually the first weekend after Labor Day. The Carstens 1880 Farmstead is owned and operated by Carstens 1880 Farmstead, Inc., a non-profit volunteer organization dedicated to the celebration and preservation of Iowa's farm history. The farmstead is listed on the National Register of Historic Places. AG Symbol - This 76' steel sculpture along Shelby's Interstate 80 exit, symbolizes the importance of agriculture, and of the men and women who work the rich land to produce food for the world, and of the pioneers who tamed the corn stalk. The sculpture highlights the major commodities produced by area farmers Ñ corn, beef and pork. Sculptor Cliff Carlson of Wesley, Iowa was commissioned to design the nearly $14,000 sculpture. The sculpture is surrounded by a beautiful garden with a gazebo placed at the center which you can sit and relax in. 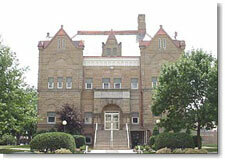 The Courthouse sits in as the center of the Historic Courthouse Square district with 51 buildings surrounding it. Of the 51 buildings, 19 were built before 1892; 27 were built between 1892-1902; and only 5 were built after 1902. In addition to the buildings, the district includes two monuments. As a result, the district conveys a very strong sense of what the Harlan commercial district looked like in the 1890s-early 1900s when commercial development was at its peak. Today the Square is full of delightful specialty shops, has an international flavor for your dining experience and offers a walking tour. If you would like more information about the walking tour please contact the Shelby County Chamber of Commerce - (712) 755-2114. Greenridge Steam Show & Gas Antique Show will be held on the third weekend of September. This event will be held in Irwin, Iowa showcasing some of the best antique tractors in the Midwest. This festival also has great food, music, crafts and a parade. Located at the Shelby County Fairgrounds in Harlan, IA. you will find one building dedicated to this 27'x35' scenic layout with HO scale model trains, railroad photos and memorabilia. Call Larry McDermott at 712 755 3584 for an appointment or see them at the ﻿annual county fair﻿ this July. Corner of Pine Street & Morse Avenue Harlan, Iowa. 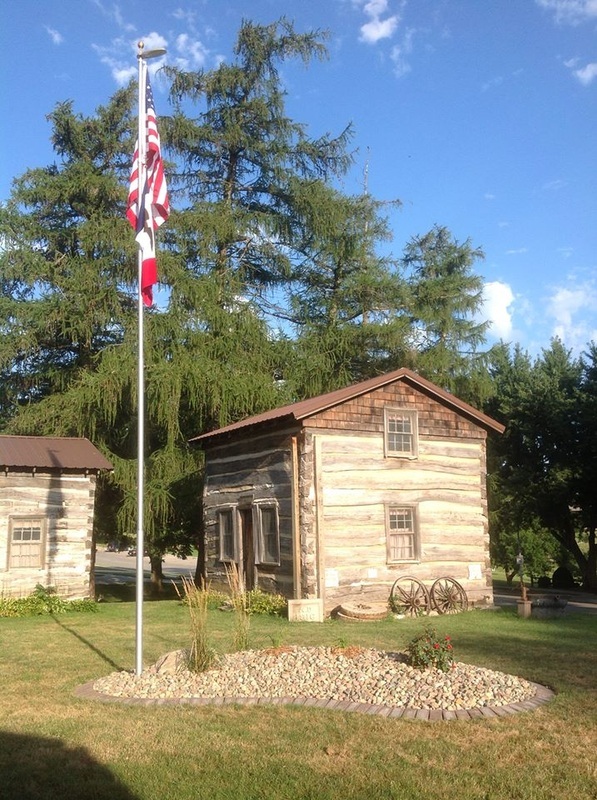 Don't miss this complex of four separate buildings including our log cabins featuring the history of Shelby County. Log Cabin Days coming in June. Historic Churches - Shelby County is famous for it's historic churches which are located throughout the area. The outer beauty and the craftsmanship of the interiors will absolutely stun you. Plan on spending the day touring these magnificent structures. This is a must see for those coming to Shelby County. The circa 1882 Church with its soaring 150' steeple and Gothic-styled architecture is breathtaking. It's numerous stained glass windows illuminate a spacious interior that is both enthralling and inspiring. Newly painted statues depicting the saints and the Stations of the Cross decorate the wall and the columns of the church. A visit to St. Joseph's will never be forgotten. Help" which is 32 ft. long, 10 ft. high and 14 ft. deep. It has 245 tons of material in it with a base of 5 1/2 ft. of concrete weighing 60 tons. The right side of the grotto contains a table in memory of World War II veterans. The grotto contains lighting effects which make it especially beautiful after dark. German Catholic immigrants completed construction in 1908 of this church featuring Gothic style architecture which is enhanced by a magnificent high altar and pillar supported arches. St. Mary's Catholic Church , Our Lady of Fatima - Portsmouth built in 1890 and constructed of bricks made locally, the Church was destroyed by a tornado in 1940. Rebuilding in 1951 included construction of the Our Lady of Fatima Shrine using Ozark stone and Tennessee flagstone and also included white Carrara Marble statues imported from Italy. In 1982 the interior of the Romanesque church was renovated. 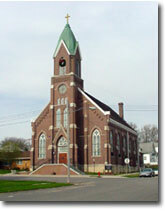 German craftsmen began construction of St. Boniface Catholic Church in 1881. The workmen baked bricks for their church and forged the church's first bell. More than 80 theater screens serve the area and annual ethnic cultural events are held throughout the region.